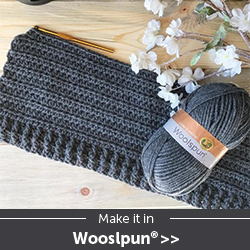 Double-thick, perfect pot holders! Made with cotton yarn. This pattern may be somewhere else on the internet, in a different context, but here is mine for the way I make my pot holders. Repeat rows 2 and 3 until piece is square. Make two and then using a steel yarn needle and the same yarn used for making them, combine them using an overcasting stitch. What size hook are using for this? Is the overcast stitch the same as a slip stitch? no I believe overcast is: yarn in needle go under both loops bring that over the top & do as 1st st--sl st is hook thru 2 loops yo & pull back thru. Did I cofuse you. Do you put anything on the inside like batting? Nope. It's two squares together. The thickness and cotton is the "batting". Did you use cotton yarn like sugar and cream? Yes. 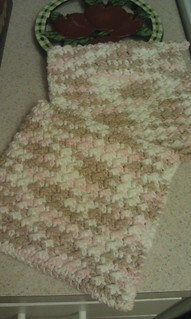 I used the Peaches n Cream cotton yarn. Never use acrylic, it can melt! I have recently gotten this pattern and used it quite a number of times. It is a fast, easy pattern and does provide an ample thickness. The only difference is I put a scalloped edge on mine. Probably the best pot holder pattern I've had. Hi Shelly. This is such a cute pattern. I made 2 sets but I was wondering if you have ever made just one (not the 2 specified for a pot holder) and used it for a dish cloth? It might not stretch out of shape if I tried a crab stitch border. What do you think? I made several of these potholders as gifts and they are great. I just finished making an afghan with this stitch pattern and it looks super. Thanks for the pattern. 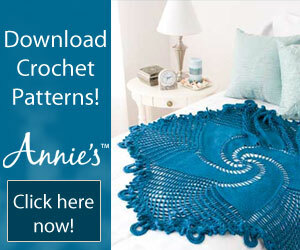 Would you please send your afghan pattern? I have done 5-6 rows and my edges are curving up. Is this how it is supposed to be or am I doing something wrong? Thank you! I made several of these potholders. They are thick and are very econimical. Thanks for the pattern. I am thinking about using this pattern with maybe cork center to make hot pads for pots to sit on. Any advice for or against would be appreciated. I don't recall the color name, but the yarn is Lily Peaches n Cream cotton yarn- bought it at Wal-mart. I am a new crocheter. This pattern looks a lot easier than the stitch I am using for a dishcloth. Do you think I could us this stitch to make a dishcloth. 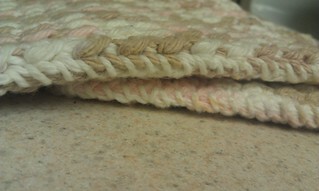 I am using a wave stitch to make a dishcloth but it can be very confusing. I have not got vety far with it because I have to keep taking it out to redo it. Getting a little frustrated and I just put it down. It works up so quickly and is so pretty! I've actually stopped using Peaches and Cream cotton yarn because it can be difficult to work with. It's quite stiff and doesn't glide on the crochet hook very easily. I switched to Hobby Lobby's I Love This Yarn cotton. It's SUPER soft, glides so easily on and off the hook, and there's many vibrant colors to play with. For your idea, I think Hobby Lobby yarn would work perfect. Just make sure the yarn is 100% cotton.